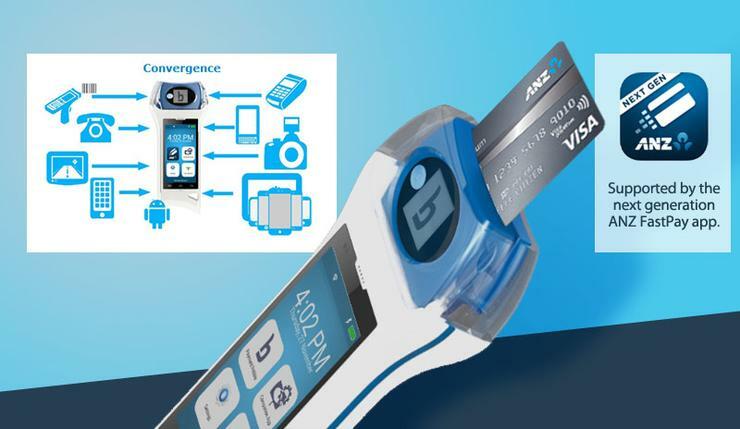 ANZ Bank will be releasing an all-in-one mobile point-of-sale device later this year to compete with CBA’s Albert. The product, the prototype of which is called Blade, will combine an Android 6 device with the bank’s FastPay card reader and a barcode scanner in a handheld set. It will also include an integrated camera and GPS and can linked via Bluetooth to receipt printers and other accessories. Users will be able to run their own apps, which will first be vetted by the bank, and communicate with ANZ’s FastPay app to complete transactions. A trial version of the device is already being used by staff in MRP stores in Australia and South Africa as well as at an undisclosed B2B delivery services company. The bank envisages Blades being used in large retail, hospitality and B2B field environments. Store assistants at fashion chain MRP, which currently has two stores in Melbourne, carry the Blade on a workbelt which also holds a receipt printer and spare paper rolls. “They wanted to change the way they service their customers,” explained Josh Peers, ANZ's strategy and innovation manager deposits and payments. “Rather than being behind the point-of-sale, they wanted to be out on the shop floor. ANZ launched its FastPay Next Generation app in 2012 on iOS and later Android which customers used with a card reader that plugged into the audio jack of their smartphone. It found some merchants wanted to use their own apps so the company released an API library which helped developers to design apps that issued intent calls to FastPay in a PCI compliant way. However, larger businesses were calling for an all-in-one device, the bank said, so it developed Blade with South African company Thumbzup which has built a similar product for ABSA (Barclays Africa Group). Blade will cost around 50 per cent less than matching a card reader with an iPhone, the bank said. ANZ imagined a range of use cases: insurance agents could use the device’s camera to take photo relating to an investigation, staff could be issued training and mobile workers could use the GPS to determine their next job. It could potentially be integrated with Xero or MYOB for automated reconciliation of transactions. The bank will vet and certify all apps developed for Blade, and they’ll be kept on its own app store. “The vetting process will be important but we don’t want to make that completely complex because we believe in the security of the device and the fact that the payment portion is separated from the untrusted area,” said Peers. “We haven’t even dreamed up half the uses of this thing and that’s why the API were going to give out to the development community to come up with their own,” added Chris Venter, ANZ general manager consumer digital technology.